uncube’s London Editor-at-Large Rob Wilson visited Out There: Our Post-War Public Art featuring works by Barbara Hepworth, Henry Moore, Ralph Brown, Geoffrey Clarke, William Mitchell, Elisabeth Frink and Paul Mount and fell to ruminating, not on the qualities of form, but the politics behind “nanny state” art for the populace and questioning the perceived role of public art then and now – something, he feels, the exhibition has failed to achieve. A thought-provoking review. Coming in from the symmetrical stone set-piece of Somerset House’s classical eighteenth century courtyard, the entrance space to the exhibition Out There: Our Post-War Public Art packs an immediate, contrasting twentieth century punch, with the crude block-like forms of an abstract fibreglass relief filling one wall. This is a fragment of an ambitious wall work by Paul Mount, dating from the late 70s, which once clad a now-demolished supermarket in Falmouth. 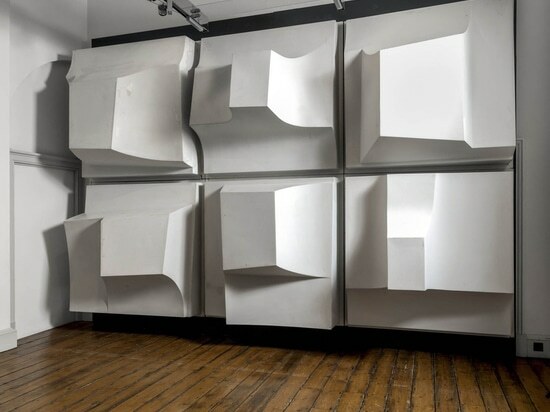 It was apparently saved from a skip by a local enthusiast and provides a dramatic, full-scale, radical opener for this exhibition on post-war public art, as well as illustrating its particular vulnerability to the depredations of time. Having been commissioned as part of the mass rebuilding of British towns and cities after the Second World War, the urban plazas and housing estates for which “public art” of the time was designed are now themselves increasingly being demolished or redeveloped. As such the Mount piece perfectly chimes with the underlying cue for this exhibition organised by Historic England (the recently rebranded advisory arm of English Heritage), which is timed to coincide with their announcement of the listing of sixteen pieces of work from the period. The show acts as a public awareness-raising opportunity, flagging both the importance and precariousness of so many other post-war works. While nothing quite lives up to the visual impact of this first piece, what follows is an impressively researched exhibition packed with further loans including several more full-scale art works, maquettes, architectural models, posters and public information films. It charts an extraordinary period of state patronage for art in the UK, in particular between 1950 and 1980. The exhibition concentrates on key initiatives and events from the time including a series of open air sculpture exhibitions held in Battersea Park from 1948 onwards, the 1951 Festival of Britain, the development of Harlow New Town during the 1950s and 60s and the Peter Stuyvesant City Sculpture Project of 1972 – which provides a loose chronological structure to the show. The exhibition effectively shows how public art was seen in the 1940s and 50s as an integral part, not just of post-war reconstruction, but also of social renewal. The planning of infrastructure, architecture and art at the time was often seamlessly integrated across civic buildings, shopping precincts and public spaces. Of course whilst the commissioning process for much of these “let-them-have-art” programmes seems uncomfortably paternalistic and top-down today, the overall intention of using public art as a tool for democratising culture, getting it out beyond the threshold of the museum, still seems an admirable one. A model and mechanism for this mass patronage already existed in the “Percent for Art” schemes – which had originated in the States during the Depression – enshrining by law that a percentage (commonly around half-a-percent) of any new public building’s budget should to be spent on art. The scheme was widely taken up by cities across the States and later copied in the UK and elsewhere, including in Germany with its Kunst am Bau scheme. This state patronage was deemed a sort of win-win policy at the time, to both support artists through commissions, while utilising their skills essentially as tools for making a better, culturally-savvy society: feeding the mind and elevating the spirit – a kind of new low-level version of Marx’s “opium of the people”. For public art is nothing if not a political act. So while the Welfare State of post-war Britain might have viewed itself as the bright sunlit “Nanny State” uplands in contrast to the dark vales of the Fascist and Soviet regimes, the value placed on public art during this period and the underlying societal benefits seen through commissioning it were not so different from the earlier huge schemes initiated throughout Germany and Russia – even if not used in quite so blatantly political (with-a-big-P) manner. Formally much of the art commissioned immediately after the War was similar to what had come before: being not, as one might imagine, abstract, but often utilising the idealised pseudo-mythic figuration – like Arthur Fleischmann’s Miranda (1951) mermaid-figure for the Festival of Britain – that had been seen a decade earlier in Germany. 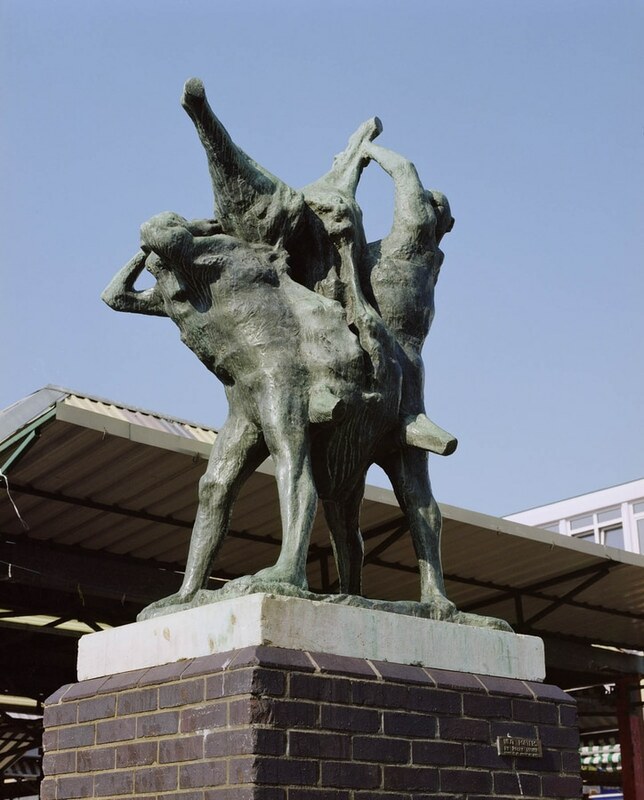 Elsewhere, the frequent pedestalling of the common man in works, like Ralph Brown’s Meat Porters (1959) in Harlow Market Square, is reminiscent in intent of the socialist realism of statues in the Soviet Union. 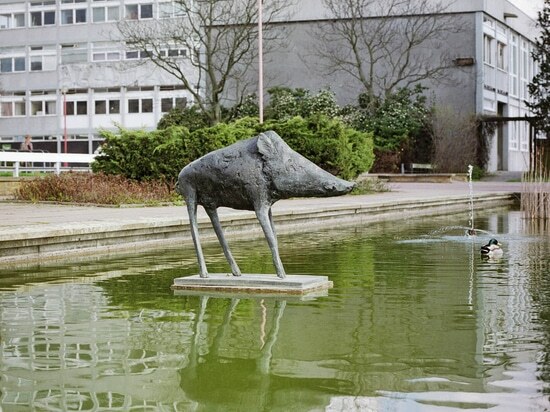 In any case the scale and subject matter is all much cuddlier and friendlier – this being local community-building not nationalist empire-building – so instead of eagles and lions we find Willi Soukop’s Donkey (1955) and Elizabeth Frink’s Boar (1970) in Harlow New Town centre and instead of battle friezes there is the Aztec-like patterning of William Mitchell’s 1963 relief panels for in the Water Gardens there too. Indeed even a hint of Cold War Politics in art could still prove highly controversial at that time, witness the cautionary tale touched on in the exhibition, of the international competition run by the Institute of Contemporary Art (ICA) in London in 1952, for “A Monument to the Unknown Political Prisoner”. The competition was boycotted by the Soviet Union and its satellites who believed it to hold an implicit critique of the policies of the Eastern Bloc – rightly as it later proved, since the competition appears to have been funded in part by the American CIA. 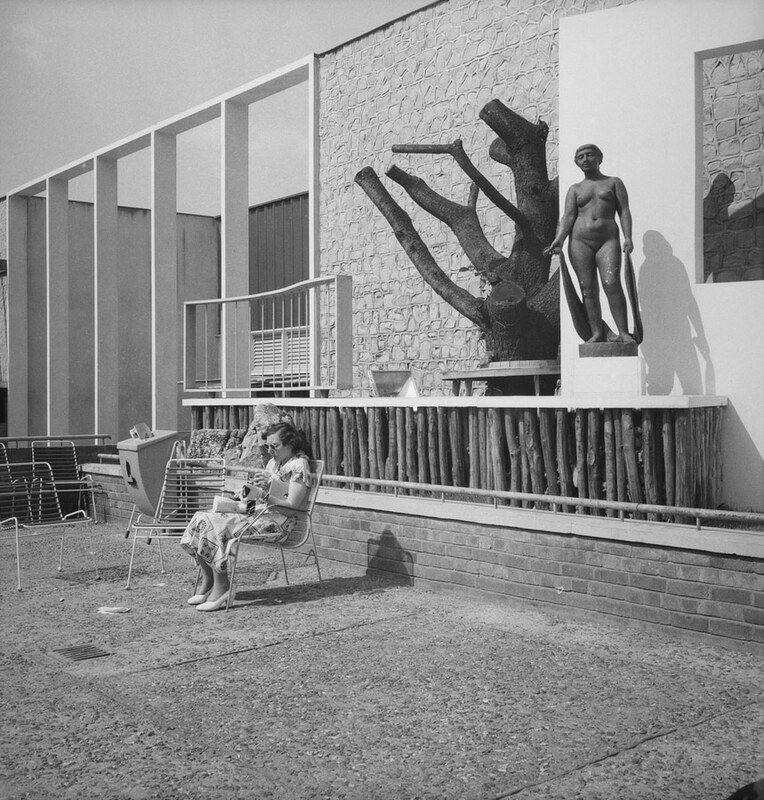 But then of course this exhibition is political in its small way, not only in respect to Historic England’s land grab for the late twentieth century as a new period of British heritage, but also in that this period of high modernism and brutalism is very trendy at the moment. The Welfare State, back-to-basics chic of the time fits all too perfectly with the current UK government’s austerity policies and also more generally in its perceived “Britain-can-make-it” spirit, with an authenticity so beloved of hipster culture. 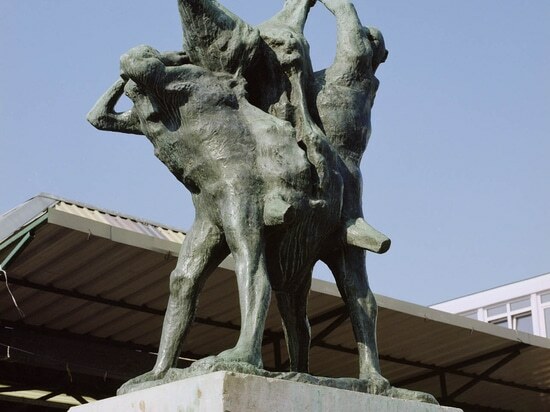 The exhibition does however shift towards a darker tone with an ill-fated public art initiative from 1972: the Peter Stuyvesant City Sculpture Project, which preceded the 1974 oil crisis, an occurrence that effectively put an end to major publicly funded art schemes for more than a decade. 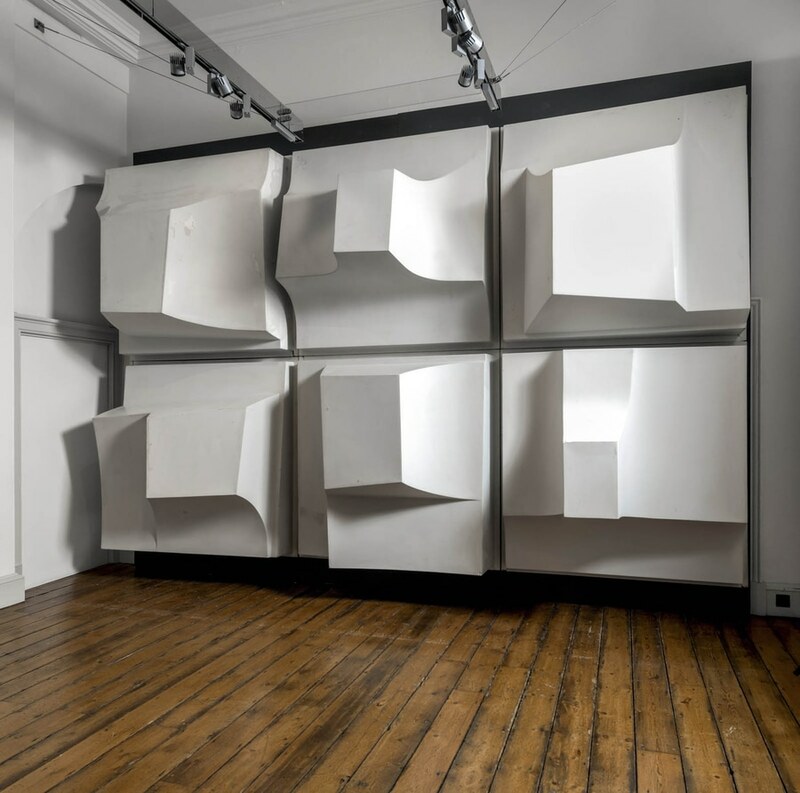 This scheme saw the loan of sixteen contemporary sculptures – mostly conceptual and abstract works – to eight British cities, for display in urban sites for six months, with the option afterwards to buy the pieces for permanent installation. 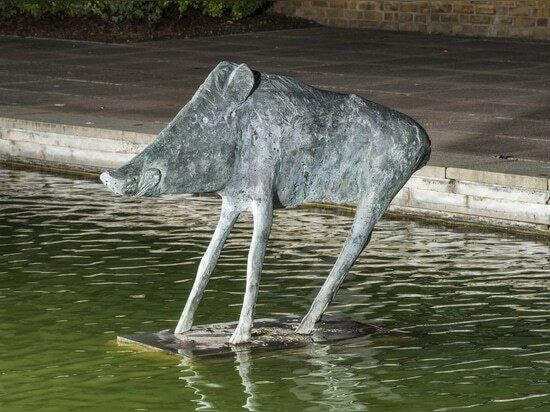 In the event however several were vandalised and at least one piece by Barry Flanagan in Cambridge was destroyed. Only one single sculpture ended up being bought and retained for permanent display. 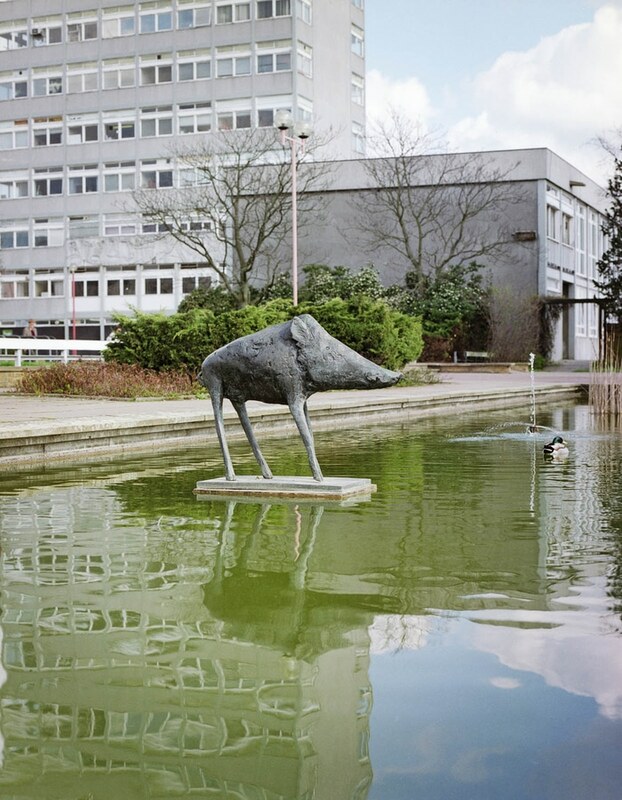 The misfortune of this scheme is taken as the springboard for a campaigning penultimate section in the show: SOS Save our Sculpture – where a roll call of those post-war public art works lost or under threat is presented. 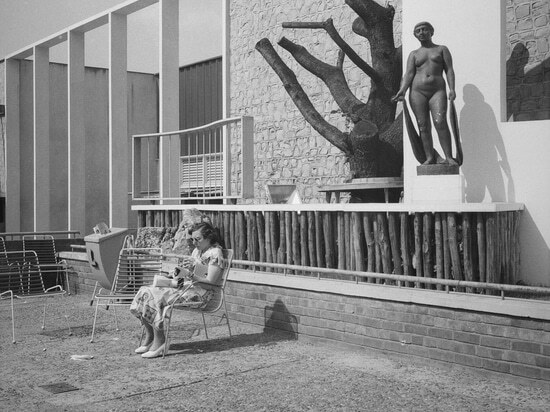 This is contextualised by a case study of a recent (successful) campaign to stop Tower Hamlets Council in East London from selling-off a Henry Moore sculpture Draped Seated Woman (1957-8), also known as “Old Flo”, which was originally sited in a local (now-demolished) housing estate in the borough, and had been expected to raise around £20 million to help plug a gap in the Council’s finances. This “SOS” campaign fits seamlessly into the current wave of architecturally focused angst over the demolition of so many of the housing blocks and civic centres of the State-fuelled urban building boom of the 1960s and 70s. These buildings are now held up as relics of a lost semi-socialist utopia – witness the SOS Brutalism campaign amongst others. Indeed the Out There exhibition forms part of the larger Utopia 2016: A Year of Imagination and Possibility programme at Somerset House. As such its interesting to consider how the heritage goal-posts have shifted, particularly in the UK, from that period itself, when the most highly influential “threatened cultural legacy” exhibition was The Destruction of the Country House exhibition held at the V&A in 1974. Back then the lost idyll was a rural not an urban one. Today, although the National Trust has yet to buy a brutalist tower block to restore to pristine mid-century modern condition, it can only be time before it or another heritage organisation does so. 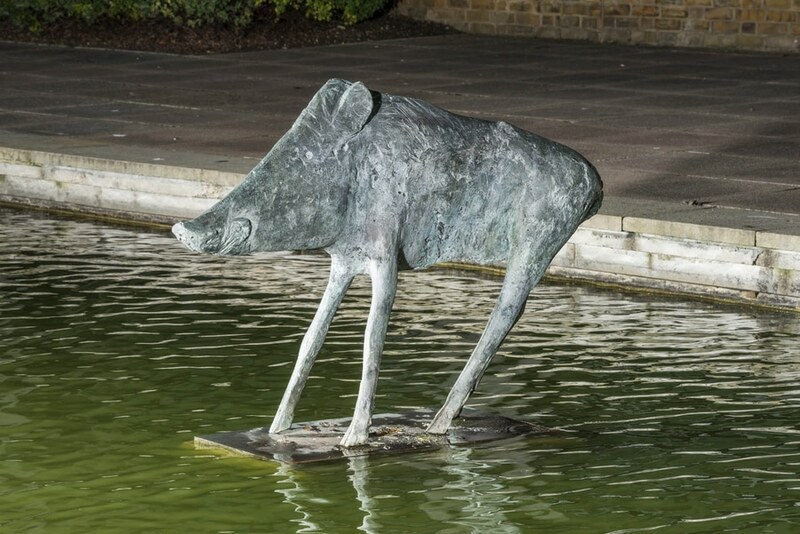 The Out There exhibition closes with a final gallery that gives no more than a token nod to more recent public art schemes – presumably because, with a forty year cut off for listing, anything more recent than 1976 is presently outside the purlieu of Historic England. Therefore there are only some sketched out some trends in public art commissioning. Tellingly many of the sites for major schemes today, like Platform London, are now confined to the more practical and less vulnerable walls and surfaces of transport hubs – spaces which are highly monitored but are also perhaps the last truly “public” ones being constructed on any scale in cities today since so many squares and shopping districts are now merely part of private developments that allow public access. Strangely though, what the exhibition’s curator Sarah Gaventa never really seeks to define or explore is what “public” art actually is. What effect does the removal of the threshold of the art gallery have on mediating people’s direct experience of art? What makes a piece work successfully in a given position – or even become loved by the public? Some of these questions perhaps parallel similar ones in architecture: where success often relies on drawing from or giving meaning to a context – indeed on being able to accrue or transmit this identifiable sense to its users. The increasingly radical modernist housing estates from the late 60s and early 70s were too often built as untested experiments, direct from the architect’s drawing board. The result was often alienated common spaces that residents felt no ownership for and that quickly fell into a spiral of vandalism and decay. 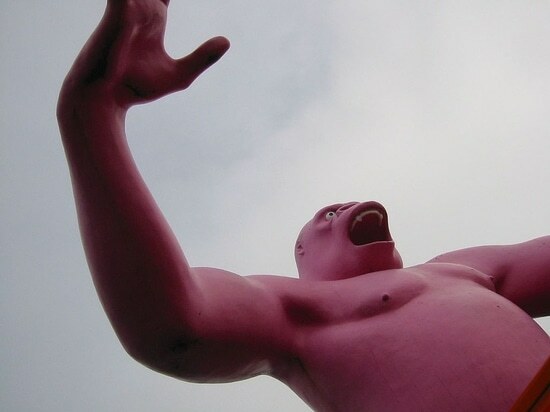 Similar perhaps, was the fate of more abstract conceptual pieces of public art – often those populating these very same urban spaces – which had themselves arrived straight and unmediated from the artist’s studio with little thought to the public context in which they were to be sited – and so provided little traction for locals to develop a connection with them, and just elicited indifference and neglect at best. Today, it seems, the thinking has swung around to the polar opposite, with the trend in art appearing to be in making it primarily relational to its audience or public – the latter often acting as a co-producer with the artist, who becomes a consultant/enabler or even a kind of social worker. It is not enough for much art practice today to have a “use” as a tool for purely conceptual or intellectual effect or inspiration – it has also to have demonstrable, practical use value, wedded to ideas of “place-making” – even home-making. This is evidenced by the winning of the Turner Prize last year by architecture collective Assemble for a work that was essentially the renovation of a street in Liverpool in collaboration with local tenants. This is private initiative stepping in where once the State would have provided. But with little space or appetite evidenced in this exhibition to explore these questions, in the end the Out There feels a bit too much like a public information film, with everything presented in a relatively uncritical, light, bright tone. Though packed with information and material, it lacks critique. Instead there is a seemingly stronger nostalgia for an idea of some optimistic post-war pre-Lapasarian period before Thatcher and turbo-charged capitalism took hold. But it is one that is still conveniently monetarised by the carefully “curated” mid-century modern ephemera redux in the gift shop as you leave.